Yolanda Crawford is a fixture at her local Muskogee, Okla., Walmart, and when she is there, it is hard to miss her or her greetings as she carries out her job, welcoming everyone as family. So when customers found out that Crawford had been trekking to work on foot every day (regardless of weather conditions), they decided to jump into action. According to KJRH-TV, within just two weeks, with some help from an anonymous donor, residents of Muskogee were able to pool together and get Crawford a set of new wheels just in time for the holidays. 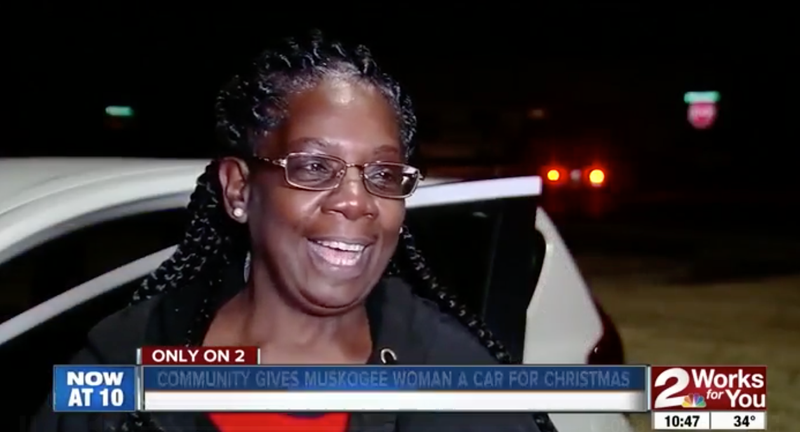 “We put brand-new tires on the vehicle, we’re paying for tag and title for her, and six months of insurance for her,” Muskogee resident Scott Yandell told the news station. Crawford was in shock, bursting into tears, when she realized that the 2014 Nissan Versa was hers. Walmart has had a notorious reputation for not paying its employees enough, among several other controversies that have followed the retail giant. However, Crawford is grateful for the community that has looked out for her and appreciates her presence so much. “I’m very excited because I never thought this would ever happen for me and it did,” Crawford said. “What better way to celebrate by giving someone a new car for Christmas,” Yandell added. Now Crawford’s way to work to greet customers will be loads easier, allowing her to do her job to the best of her ability. “The community loves me and they appreciate me for saying ‘Welcome to Walmart’ to them as they come in and out of Walmart, and I appreciate them as well,” Crawford said.